Last weekend I went to the Conquest tournament in Dendermonde, Belgium. It is the annual tournament of the Knights of Bayard, run by two of my former ETC teammates @kiwii @Timon and it gathers a good crowd! This year 26 people showed up, including ETC players from Luxembourg, Belgium as well as very good local tournament players. We got Frontline Clash and as a secondary objective we got Secure Target. 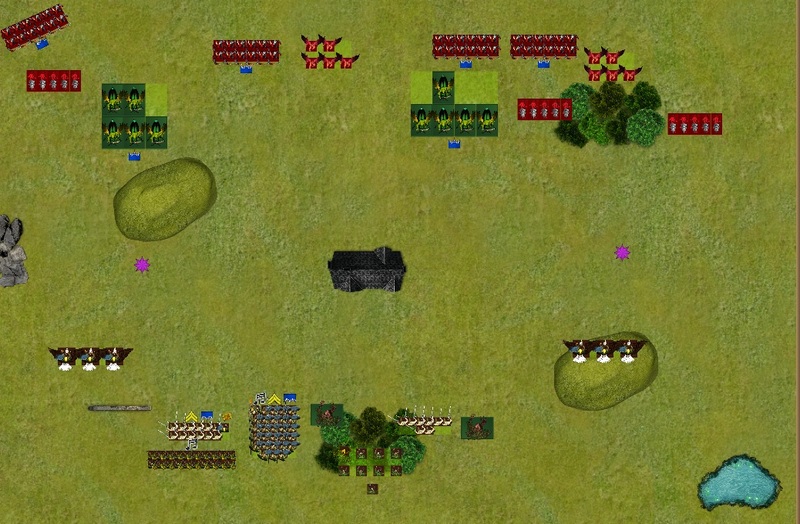 I used my objective marker to divide his army, placing it very far from its counterpart: my opponent would have to divide his forces to claim the objective. For magic, my Druid got Awaken the Beast, Insect Swarm, Break the Spirit and Savage Fury, while the Matriarch got Healing Waters and Master of Stone. My opponent rolled The Wheel Turns, Will o’ the Wisp and Twisted Effigy for his spells. After alternating deployments for a while, my adversary dropped everything to get the first turn. The end result was two clusters of deamons near each of the objective markers, each protected by a blight fly unit. I knew right off the bat that engaging the Flies was to be avoided as long as they were at full strength, so my plan was to weaken them for the first few turns. 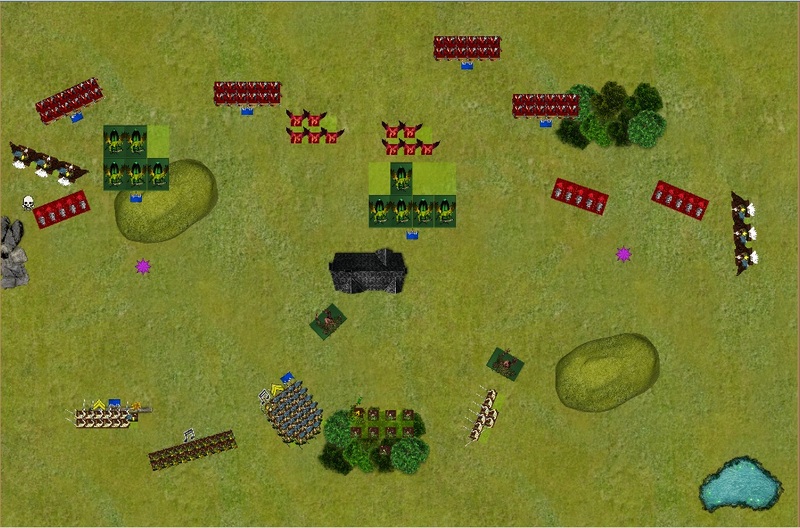 I loaded my left flank, keeping the treefathers centrally and kestrels ready to fly over the enemy lines on turn 1. My opponent won the roll for the first turn, and battle was joined. The enemy army advanced rather cautiously across the table, my treefather and bladedancers effectively zoning the blight flies. In magic I let go the Wheel Turns and stopped will ‘o the wisp and twisted effigy. On the left side the Kestrels found a blind spot where they could land, threaten the enemy scorers and be safe from enemy charges due to the huge footprint of the blight flies. Their counterparts on the right outflanked the hellhounds, ready for a turn 2 charge. In the middle, the two treefathers and the small bladedancers angled themselves to deter any fly moves over the building and right into my back yard by the flies. In the magic phase the ring of fire was stopped, but the insect swarm managed to deal a couple of wounds on the leftmost blight flies. Then, I put Break the Spirit on the right flies, so as to be sure they wouldn’t move aggressively. Shooting only managed a single wound on the left hellhounds. My opponent briefly considered combo-charging the right treefather with both hellhounds (the picture is wrong, one of them could get into the flank), but some quick math and the realization that he’d be able to thunderstomp them deterred him. Disaster struck in remaining moves, as unit after unit of daemons failed their Ld7/ Ld8 march tests and were reduced to a crawl reminiscent of 6th edition Warhammer. One unit of Furies flew right in front of my archers, threatening my mage, while on the right flank the hellhounds moved up aggressively, finding blind corners where neither treefather nor bladedancer could touch them. The magic phase proved to be uneventful, since a combination of channel and good rolls for dispel shut down the entire phase. The only charge I had this turn was the Kestrels into the rear of the rightmost Hellhound unit: this would give my bladedancers time to move up and support the kestrels on my turn 3. I needed to stop the hellhounds from advancing, but also to block the flies’ movement . So I parked my treefather in front of the second unit of hellhounds, leaving no space for the flies to land or charge. 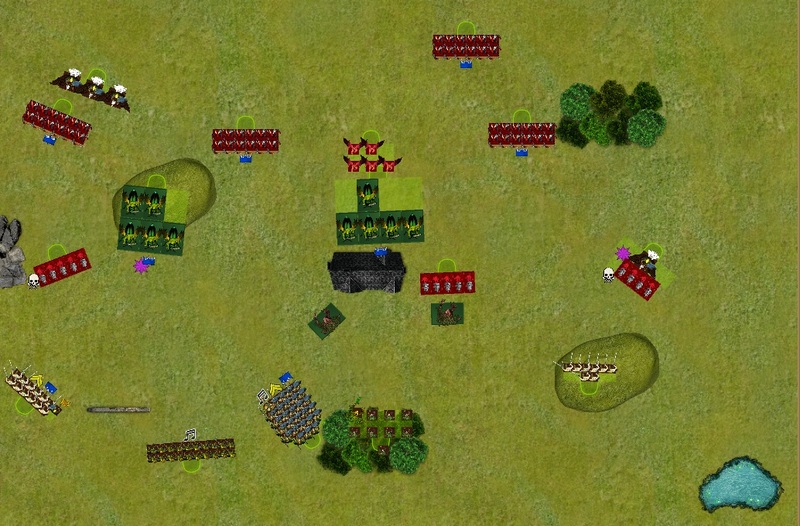 On the left, the kestrels moved to the backfield of the daemon army, threatening at the same time three units with rear charges. Magic was pretty tame, I only managed to cast the ring of fire on the left furies. The shooting from the archers finished them off. In combat the kestrels whiffed completely due to extremely good daemonic saves. The hellhounds retaliated and killed two (!) knights, meaning that I only won the combat by 1. A good daemonic instability test later and I was in trouble. The middle hellhounds charged into the treefather while the rest of the daemons shuffled forward for lack of a better option. And I say «shuffled» because once more a couple of march tests were failed! My opponent set up a trap for my big bladedancers to the left, tempting them to charge into some hellhounds and get countercharged by the flies for their trouble. The second unitof furies was sacrificed to redirect the forest guard and the treefther away from the left flies. In the magic phase I put all of my dice into stopping the Will o’ the Wisp on my big wardancers (that would force them to take the bait/trap) and thus had to take a Wheel Turns on my Treefather in combat vs the Hellhounds. Thankfully, that combat went my way: the treefather only took a wound and proceeded to stomp the hellhounds to pieces. One failed daemonic instability later, and the hellhounds were no more. The single kestrel survivor managed to dodge all of the hounds’ attacks and stay in combat for another turn. Tempting as it was, I declined both the trap on the left and the treefather charge vs the flies on the right. The reason behind that was that I needed to get the enemy scoring units, or at least keep them away from the objectives. With that in mind, my left kestrels charged into the topmost slaughterers, the Forest Guard took the fury charge (they were out of the flies’ LoS) and the small bladedancers charged downhill and into the hellhound/kestrel combat, conveniently positioned next to the objective. In remaining moves the treefathers both moved to the right flank: the victorious tree had to stop the slaughterers from advancing, and his counterpart had tokeep the flies honest. The archers and big bladedancers shuffled backwards a bit more. 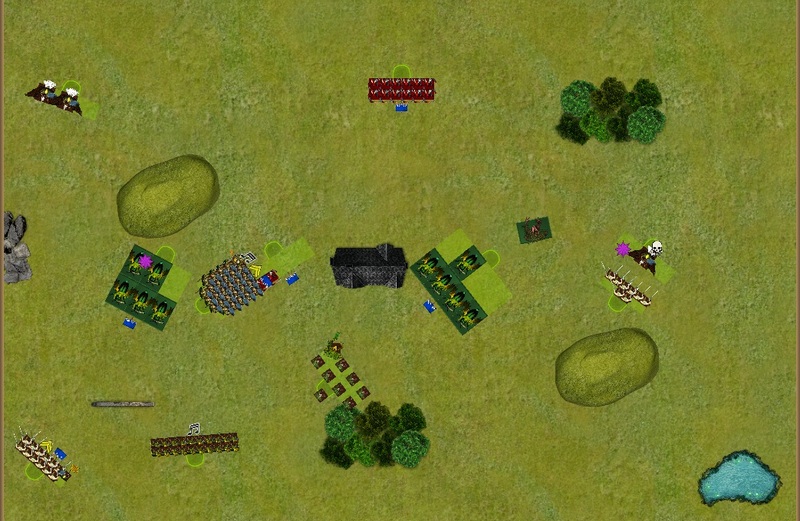 The magic phase was uneventful, and in the shooting the Treefathers’ roots started putting a dent on the rightmost slaughterers (another error in the map, the slaughterers took a couple of wounds). Combat saw the dancers kill the hellhounds outright, while the kestrels dealt 5 wounds for none back to their adversary. Thanks to steadfast, the Slaughterers held their ground for a turn. At the end of my turn, the tournament organizer came by to let us know that we could play another turn and wrap up the game: Sebastian was not very used to playing with an MSU army, meaning that each of his movement phases took a lot of time (he was in no way stalling, since this was actually to his detriment!). So we agreed that turn 4 would be our last turn. Going for broke, my opponent declared some charges: the hellhounds to the left and the blight flies went into the bladedancers (only the hellhounds made it), the other blight flies charged into the treefather and the slaughterers went for the second treefather. 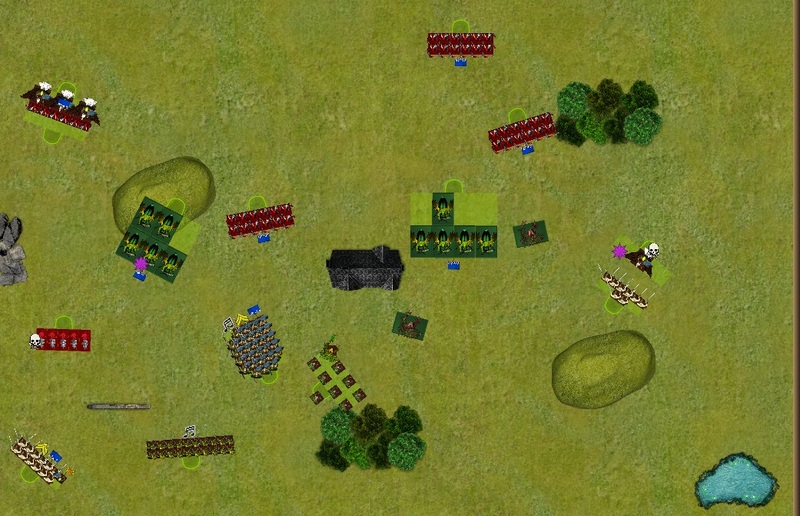 The slaughterers in the middle spotted my Dryad bunker and attempted a long charge, which they failed: this would open up their flank to a last-turn charge by the Forest Guard. Magic was pretty uneventful, leaving us with combat: the Bladedancers with BSB instantly killed the hellhounds with the help of their extra attack dance, while the treefather stomped some slaughterers to the ground. The flies dealt a single wound to the Treefather, who fluffed his rolls AND his stubborn Ld9 test and ran away. He was caught in pursuit, but at least the flies were blocked by the building and were unable to pursue into my dryads. With the objective secured, my last turned focused on getting some more points: the forest guards flanked the slaughterer unit in the middle, and in magic I attempted to buff them: in the end, I got Regeneration and Frenzy on them, but not +1 Strength. This meant that the Slaughterers survived the battle with 2 models left! The kestrels dealt with the top slaughterers and the treefather finished off his. In the end, I had lost the single treefather and had gotten a good chunk of points in the form of the furies, hellhounds and slaughterers. With the bonus objective points, this ended in a 16-4 win for the Sylvan Elves! This match was decided in my opinion by three things: The lack of long range threats in the daemon list, the fact that my opponent split his army to cover both objectives and, finally, his inability to roll well enough for march tests. The fact that we only got in 4 turns also helped, although looking at the state of the battlefield by endgame I was confident I could have limited any losses to the blight flies while getting the points for the remaining core. The treefather failing his Ld test and legging it was unfortunate, but that's what you get for keeping him out of the BSB bubble! My opponent was a very nice guy, we spent some time discussing different approaches to the game and to the MSU daemons in general. I like his list, I just felt that he needed a way of putting pressure during the first few turns, either with magic or some ambushers. The good result of this game propelled me up the top tables, where I'd be facing an ETC teammate and his KoE! Stay tuned for the next update, and feel free to discuss/comment below!